I want to see this movie. I'm not a movie buff, but this is one of the few movies that just captures my attention. This movie was so intense, and, I must say, a tad disturbing at times. Natalie Portman was flawless. I also thought Mila Kunis was exceptionally captivating as Lily, a character that served as a foil to Natalie's Nina. The plot itself was mediocre at best. Like I said, it was a little disturbing at times. The direction, however, was amazing. All in all, a great film. Well-deserving of all the hype. I know. Very disturbing. I've actually begun to wonder how sharp nail files really are? I am however absolutely in love with the score of this movie. It is so amazing. There is this track called "Nina's Dream". Check it out. It's one of those songs that when you hear it, you're taken back to the movie. The swan noises and the laughter are all so subtle and well laid out through out the movie, it gives you a taste of insanity, if I may. If you've watched "Requiem for a dream" and found yourself being haunted by the movie everytime you hear the Requiem for a Dream soundtrack cos it makes your heart to beat harder, please check out the score for this movie. 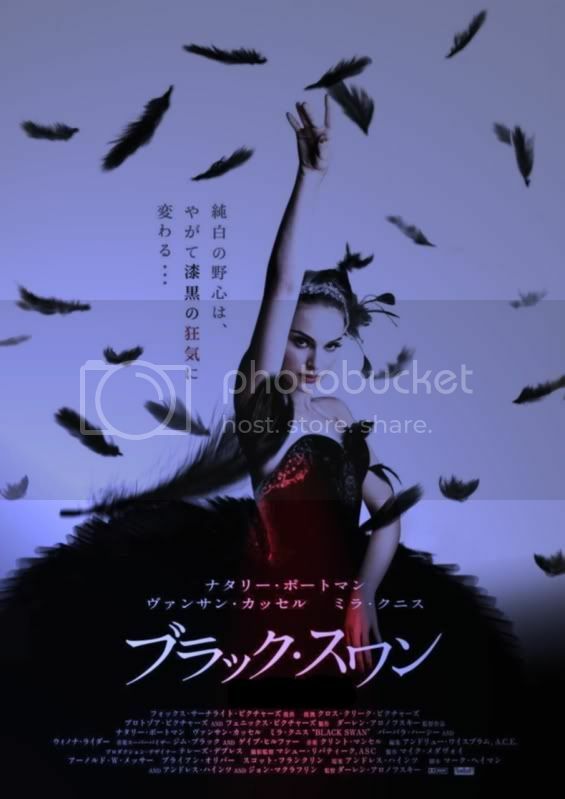 I think Black Swan is amazing. It was no surprise really that I loved the movie so much since I tend to love tragedies. I guess my background as quite an obsessive gymnast made me relate to Nina so much, too... I still remember the enormous pressure which was mostly built by myself. All in all, I found Black Swan hauntingly beautiful. I've also listened to the soundtrack for weeks now and still feel something I quite can't put in words while listening to it. Dancing something close to ballet to the tracks Perfection and Nina's Dream is great. But it was a fantastic movie. Totally reminds me of Natalie in the subway and going to and from ballet!